My recommendations are going to run the gamut on this one, from atmospheric ghost stories to postmodern genre mashups to Lovecraftian stories of cosmic dread. 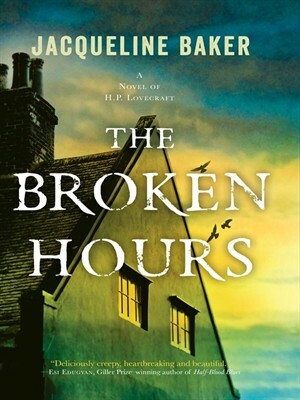 The Broken Hours by Jacqueline Baker: An atmospheric and creepy tale about Arthor P. Crandle, a young writer down on his luck hired as a personal assistant to none other than H.P. Lovecraft, wizard of the Weird. The prose is incredibly eloquent and Baker manages to create an atmosphere of tension and gloom, but also of loneliness and loss. You can find hauntings, tentacles, and clever twists in this beautiful book. House of Leaves by Mark Z. Danielewski: I wrote my Master’s thesis on this novel, and while it definitely has some pretty big problems, there is no denying that the Navidson house story line is absolutely terrifying. The Navidson’s discover that their house is bigger on the inside than on the outside, manage to cope with the sudden appearance of a door that leads to a dark passageway that changes shape and size, and then embark upon an expedition to explore the passage. Bad things ensue. Add to that the absolutely brilliant and utterly disorienting layout of the book, and the spooky qualities of the accompanying “soundtrack” by Danielewski’s recording artist sister, Poe, and you have all the makings of a freaky read. The Woman in Black by Susan Hill: Written as an exercise in genre, this novella is conventional but exceedingly effective. The isolated and dreary landscape, the imposing architecture, the restraint of the characters, the palpable fear of the townspeople, the repressed grief of the protagonist… all of the elements of Victorian Gothic are here. The film version is also very well done, managing to avoid the gore that so many horror films are dependent upon now. The Shining Girls by Lauren Beukes: I’m not usually one for reading crime stories, but this is the story of a time-travelling serial killer and the one woman who survived him. It’s an absolutely cracking read, and I must say that during the climactic scene in the novel the sense of dread was so visceral that at many points I wanted to put the book down because I wasn’t sure I could face what was coming. Despite my desire to escape the inevitable horror, I was compelled to continue reading and couldn’t make myself look away. So, even though this isn’t a horror novel, per se, I found it absolutely horrifying (in a good way). Annihilation by Jeff VanderMeer: This was a single-sitting read for me. It’s got that “unity of effect” that Poe (old E.A., not the musician mentioned above) wrote about, and it’s got that Lovecraftian sense of cosmic dread. A team from the Southern Reach organization embarks on an expedition into the mysterious Area X. The story is intense and uncanny, and will leave you breathless in anticipation of the second book, Authority, which will in turn leave you breathless for the third book, Acceptance. Strap in and enjoy the ride.